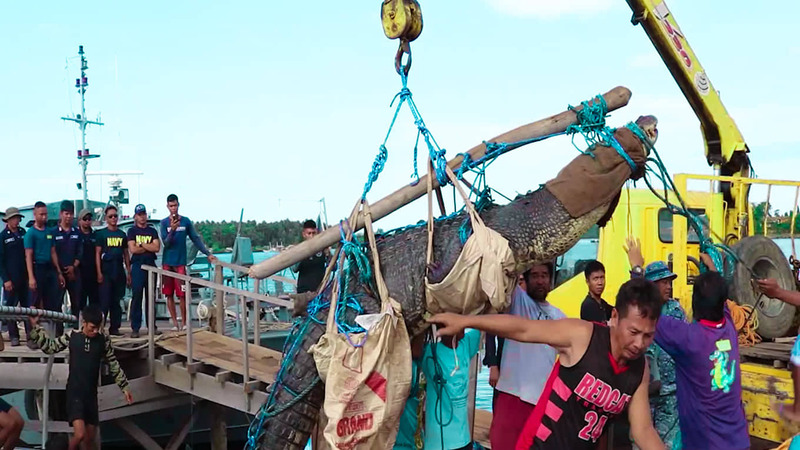 The Palawan Wildlife Rescue and Conservation Center (PWRCC) confirmed Wednesday that the 15.6-foot male saltwater crocodile they have captured in Balabac was the “problem crocodile” that killed a fisherman in the municipality recently. Crocodile expert and PWRCC technical section chief Salvador Guion said Wednesday in a media conference at the Palawan Council for Sustainable Development Staff (PCSDS) office that they named him “Singko” after Poblacion 5, the coastal village in Balabac where he was caught on December 1. The PWRCC captured him by using a cable snare trap device with goat meat in the water of Carandungan Bay in the barangay. “Ito ay analytical. Considering other reports, sabi nga namin noong una, napakataas ng porsyento na siya nga po ang umatake. Sabi nga namin sa verbal conversation namin inilalagay namin sa 95 percent na siya na,” he said. After securing Singko, he explained that the PWRCC team went back to Carandungan to get the testimonies of the family of crocodile attack victim Cornelio Bonete. He said Cornelio’s eldest brother Efren told them that he is sure the saltwater crocodile (Crocodylus porosus) was the attacker because of a wound that its tail sustained when it trashed the outrigger of their motor banca. “Sinabi niya na ito na nga ang crocodile na umatake sa kanyang kapatid dahil daw doon sa tanda o maliit na sugat na nakita niya. So, idinagdag po namin sa 95 percent ito na sabi namin, sige limang porsyento ‘yong impormasyon na ‘yon,” Guion said. Based on these observations, he stated that Singko is the “100 percent attacker” of Cornelio, whose mutilated decomposing body was found in Barangay Malaking Ilog on November 28. Guion further explained that no other crocodile of Singko’s size has been sighted in the Poblacion 5 area, indicating it is the most dominant male compared to others. PWRCC director Ronie Gandeza said their declaration of Singko being the problem crocodile was decided without making it undergo the gastric lavage procedure anymore. The procedure is a protocol in extraction that must be done to flush out the content of the stomach of a suspected problem crocodile. Gandeza explained that based on the assessment of veterinarian Dr. Terry Aquino, submitting Singko to gastrointestinal decontamination is no longer “advisable” as he was already in ”so much stress” when he arrived in their facility in the afternoon of December 4. “Ang sabi ko i-assess ‘yong condition ng crocodile kung kailangan pa bang gawin iyon. Sa kanyang assessment ay sinabi niya na very stressful na ‘yong hayop. Sabi niya kailangang mabitawan na agad kasi baka ‘yon pa ang maging cause ng death niya. Sana kung nakarating daw agad ay puwedeng gawin ‘yon,” he said. Singko’s transfer to Puerto Princesa City was delayed by the persistent strong waves that prevailed in the water of Barangay Rio Tuba, Bataraza, where it was first brought from Carandungan Bay. It was supposed to be transported by the BRP Cabra (MRRV 4409) of the Philippine Coast Guard (PCG), but the PWRCC team decided instead to bring it by land to their facility to prevent prolonging its stress. “Very sure naman na sila na ito na nga ang attacker. Kasi kung gagawin natin [ang gastric lavage] baka mamatay pa ‘yong crocodile,” he said. The PWRCC is now keeping Singko in a 20 x 25-square meter holding pen in their facility’s breeder area. He will join the conservation center’s 255 other saltwater and freshwater crocodile breeders that are also inside individual pens. Gandeza said the 500-kilogram crocodile has the potential to become a breeder because it came from its natural habitat. Crocodiles that are caught from the wilds like Singko have “good genes” that can make them productive breeders.